We're still working on getting the site finetuned! Slowly slowly! Thanks for your patience and to everyone who has 'joined'! We'll get this rolling soon so soon. I've even been on an unofficial Slow Bicycle Ride here in Copenhagen and have a little film to upload soon so soon. In the meantime, here's some inspiration from a French-language blog Bike in the City. 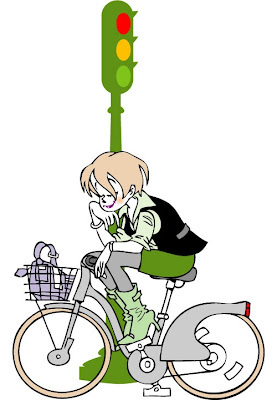 Chock full of cool drawings about the protagonist, Leah, and her cycling life in Paris. The drawing above is brilliant and perfect for The Slow Bicycle Movement. A little cylcoversion of The Thinker by Rodin. Still sorting through the proposals and following the exciting discussions. This is all very cool. We're going to make a list or two of proposals and post them for you to vote on. So here's me back from the Swedish summer house. What a thrill to see so many comments. Give Marie and I some slow time to read them and to start making lists of members and of suggestions for a manifesto. In the meantime, the video above is a lovely example of Slow Bicycle, from the streets of Copenhagen. Oh, and in a moment of concentration I actually started a Facebook group because that's what one must do these day. The group will be even slower than this blog, so stick to the present URL for slow updates. But it'll be nice to see you all in your profile photos and to get an idea of how many members we have. I'll return casually in a day or so. So I figured it was about time that we finally got around to this Slow Bicycle Movement that popped up over at Copenhagenize.com. Not that there's any hurry, of course. Marie and I discussed it the other day and I took my time making this little internetty place that the Slow Bicycle Movement can call home. And, hours after launching it, I'm going on holiday to the summer house in Sweden. Appropriate, really, don't you think. So. This is the first post. Um... go make a cup of coffee or tea or something. Okay. Hi. So, I suppose it's official. The Slow Bicycle Movement is launched. Now go and have a beer a glass of wine or something nice. We figure the Slow Bicycle Movement is all about the journey, not the destination. The destination is, invariably, a fixed geographical point which isn't going anywhere... [okay, sure, the tectonic plates are in constant movement but they are thankfully even slower than us]... so you're going to get there eventually and anyway. It's about riding your bicycle. To work, to play. Casually, in a relaxed manner. With time to enjoy the self-propelled movement that you and you alone generate. And, of course, to look around and see the landscape - urban or not - that you pass by at your leisurely pace. It's time to take cycling back and place it firmly in the category "normal way to get to work, to the shops, to the cinema". Indeed, "normal things to do". This is for those who enjoy the ride. There are a kabillion websites/forums/blogs out there for those who enjoying riding fast/competetively [couldn't be bothered spelling that right]/in lycra and gear/what have you. THIS is OUR place. Listen. What we need to do is twofold. We being Marie and I and all of you out there. Let's get a list of members going. Write a comment and state your name and, if you have one, your blog/website. And add a graphic to your blog/website so we know you mean it and are proud about it. When I get back from hols, we'll post them on the right columny thing. The blogs/website links, I mean. We'll make a post with a running list of members. Okay... now we need to pen our Ten Suggestions. We're not going to go around Commanding anyone. We'll settle on Suggesting. What could these Ten Suggestions be? Write a comment with your suggestions. They should be bicycle related, of course. Nothing too broad. We don't want to step on the Slow Fish Movements toes. I have a couple off the top of my head. - Maximum 15 km/t [the average speed for cyclists in Copenhagen] unless flying down a hill... wheeee! We can vote on the best ones. Enough for now. These inaugural posts are exhausting. Besides, I'm going on holiday tomorrow, so I have to pack. Marie just got home from two months in Malaysia, so she's catching up with friends. See you next week and let's get those comments rolling. Slowly. Here's some badges for your blog or website if you have one. They're a bit updated compared to the first mention of the Movement on Copenhagenize.comOh, and we have merchandising!